A full public hearing for the budget will take place at the board’s April 26 meeting. The Eastern Camden County Regional School District Board of Education has approved a resolution to submit the tentative budget for 2017–2018 to the executive county superintendent of schools for approval. According to district business administrator Diana Schiraldi, this year’s total budget will increase about 1.25 percent from last year. The total for this year’s budget is set at about $38.1 million. Schiraldi said the budget would use a 2 percent tax levy increase. The total portion of this year’s budget set to be raised by taxation is $25.9 million. Schiraldi also said the district received its state aid notice on Feb. 24, and the district will be receiving the same amount it did last year. “No increase and no decrease,” Schiraldi said. More details of the budget, such as the tax impact on average homeowners and how the tax levy is split between the district’s three sending district’s, will be reviewed at the board’s April meeting after the district receives approval from the county. • The board approved a draft of the 2017–2018 school calendar. Superintendent Harold Melleby, Jr. described the calendar as similar to standard calendars in previous years. However, Melleby did note that one change to next year’s calendar is school will now be open on Election Day — Tuesday, Nov. 7. “The building isn’t used for elections, and it’s not a national election,” Melleby said. While in past years the day was used as an in-service day for staff, Melleby said staff would now make up the in-service day during a school closure on Thursday, Jan. 25. According to Melleby, Jan. 25 was selected as the day between two semesters. “It will be in-service for staff, but it will also give them an opportunity to wrap up whatever they would need to from the one semester before the next semester,” Melleby said. Melleby said the number of days in the calendar remain the same, with 189 days for staff and 183 days for students, with three days designated for testing. • Melleby said athletic director Jason Hill was in the process of checking with other schools in the Olympic Conference regarding the rates those districts charge for use of their athletic facilities, specifically their athletic fields. 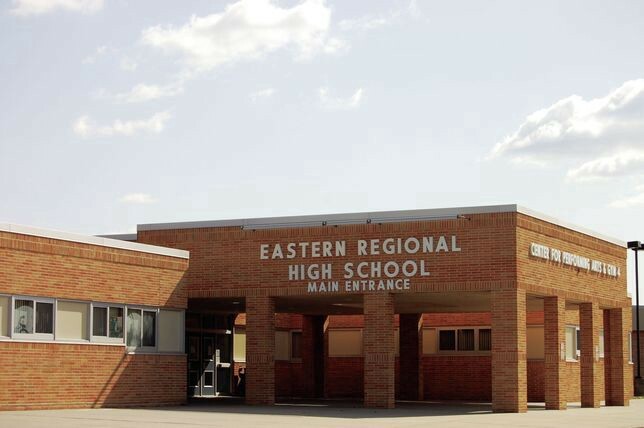 Melleby said Eastern has not raised its rates for a number of years, and Hill would most likely be submitting a suggested adjustment to the board and its finance and athletic committee before the end of the school year. “We’re not looking to make a killing, but it is source income and it helps to support our programs,” Melleby said. Once presented to and approved by the board, Melleby said any change would then be effective July 1. The next meeting of the Eastern Camden County Regional School District Board of Education is scheduled for April 26.